The following Sunday School lesson is a free sample Sunday School lesson. 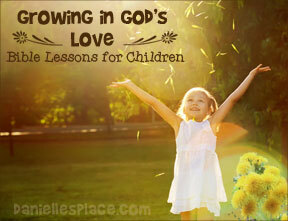 This lesson and many more Sunday School lessons available to members on The Resource Room. 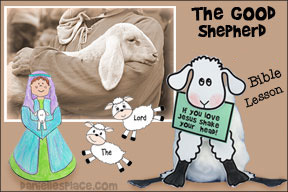 These lessons are great for use in Sunday School and Preschools - This is a sample lesson in the series of lessons using the alphabet and animals to teach biblical concepts to preschool through elementary-age children. 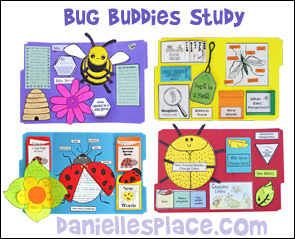 This curriculum can be adapted to the age and ability of your children. 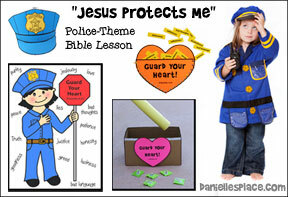 (Younger children) Print out onto card stock, write the Bible verse on the cards and make copies. Sluggard (slug): a person who does not like to do any kind of work, but likes to sleep or be idle all the day long, a lazy person. We can learn from the ants and become wise. The ants do their work even when they don't have someone telling them what to do or checking up on them. 1. Have your children draw an anthill on a piece of paper or use the printable pattern. 2. Have them color the picture, and then place sandpaper behind the picture and rub the edge of a crayon over the surface to make the bumpy sand effect. 3. Then have them press the tips of their fingers on an ink pad and press them on the paper to make the ants, and then add legs and antennae with a marker. Set up an ant farm. Watch the ants work. Go for a walk and look for ants. What are they doing? Follow them back to their homes. At the beginning of class set out a plate of different foods near an anthill. At the end of class go out and check up on the plate to see if any ants have come for a meal. What did they like best? 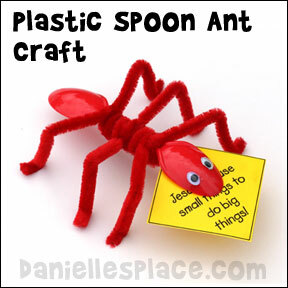 Preparation: Before class set up a ant trail in a separate room or down the hall. At the end of the trail hide pieces of paper with one each of the following words written on them. "We can do our work without being told to do it." Write numbers on the backs of the paper in the order of the sentence so you will know where to place each word. You probably saw the ants scurrying around in all different directions going in and out of the anthill, bringing in bits of animal parts, seeds, and other things and bringing out little rocks and plant materials. They all seem to be doing something. Did you ever see any of the ants just sitting around watching the other ants work? Did you ever see an ant just sitting there waiting for someone to tell her what to do? No. Every colony of ants has a queen ant, but she doesn't tell the other ants what to do. She doesn't organize them or give them pep talks. She's too busy laying eggs. She lays eggs all day long. All the ants in the colony have a job to do. There are lots of things to do in an ant colony. Some of the ants help take care of the larva or baby ants. The anthill has to be kept clean and in good repair. New quarters have to be built as the colony grows. The anthill has to be protected. Some of the ants have to go out and find food and then carry it back to the nest. All the ants have a job to do and they do it. They don't worry about whose doing what or how hard they're working. They see something that needs to be done and they do it. They don't need someone to tell them it is time to get to work, or remind them what has to be done. They just do whatever they can to keep the colony going. What would happen if the ants didn't do this? They probably wouldn't get much done. What if a little ant saw some garbage or trash laying on the floor of the colony and she said to herself, "I didn't put it there, so I'm not picking it up. I didn't make the mess, so I don't have to clean it up." The colony would soon become clogged with garbage, wouldn't it? God made the ants. He gave each one a job and they do it. They don't need someone telling them what to do all the time. They just do it. Did you know that the Bible tells us that we can learn from these little ants? (Open your Bible and read the verse.) 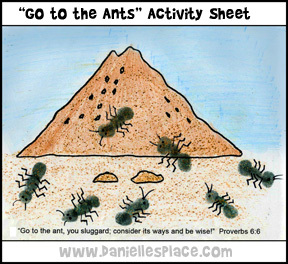 In Proverbs 6:6 it says, "Go to the ant, thou sluggard; consider her ways, and be wise." Now we are going to find out what the ants can teach us and how we can be wise. (Write on the board "What can we learn from the ants?" An ant has left us a scent trail and the answer to this question. (Show the children the beginning of the trail. Ants don't have anyone to guide them and tell them what to do. They don't have someone watching over them to make sure they do their jobs right. They know what they are supposed to do and they do it. They don't need someone to make sure they do it and do it right. This verse is telling us that we should be more like the ants. When we see something that needs to be done, we should do it. We shouldn't have to wait for someone to tell us to do it. If you see a crayon on the floor, you should pick it up. You know crayons don't belong on the floor and they can get stepped on and squished if they remain on the floor. Even if you didn't use the crayons, you should still pick it up because it needs to be picked up. You don't have to wait for your teacher to tell you to pick it up. You can be wise and decide for yourself that that is the right thing to do. Do you wait for your mom or dad to tell you to do your chores, or do you do them because you know you have a job to do? Your parents shouldn't have to tell you to do your chores every day. You should try to remember what you are supposed to do and do it without someone having to tell you to do it or reminding you. The older you get the more jobs and responsibilities you will have. Your parents can't remind you every day to do everything you are supposed to do. A wise child will try to remember what he is supposed to do and do it without having to be told. Can you think of some things that you are supposed to do that you can try to remember to do without having your parents tell you each time? (Let the children respond.) Here are some examples: make your bed, brush your teeth, comb your hair, pick up your toys when you are done playing, clean off the table after you are done eating, do your chores, etc. When you do these things without being told, you are being wise like the ant. What are some of the jobs Jesus wants us to do? Show people we care, listen to others, share our faith, invite a friend to worship, help to keep the church clean, etc. Do we have to wait for someone to tell us to do these things? No, if we are wise we just do them because they need to be done. Father, Help us to be more like the ants to get our work done without having to have someone tell us what to do all the time. Help us to be more responsible to do what we are supposed to do without having to be asked to do it. And to be aware of things that need to be done and do them even though we haven't been asked to do them. Help us to be diligent in our work, not to give up to easily when things get hard. Amen. 1. Before class print out the ant pattern and cut the shapes from black poster board. You will need two ant shapes per ant. 2. Use one pattern to punch holes in the ant's body where indicated with very small hole punch. Don't use a hole punch that makes big holes. If you don't have a small hole punch, use a large needle. Put a white mark over the hole with some chalk so the children can find the hole. Punch holes for the antenna in the other body pattern. 3. Cut Chenille Stems in half for the legs. You will need two and one half pipe cleaners per ant. 4. 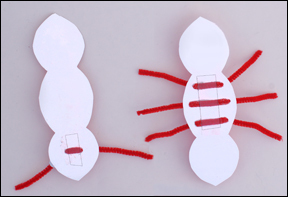 Show the children how to stick the half Chenille stems through one hole on the side of the ants body and bring it under the body to the corresponding hole on the other side of the ants body. Show them how to bend the legs. Do this for the other 2 sets of holes. When all the Chenille stems are in place tape them down on the under side of the ant. Use the other half pipe cleaner for the antennas. Glue the two patterns together so that the pipe cleaners going across the pattern are on the inside. Don't glue the mouth closed. Tape the note in his mouth. 5. Glue wiggly eyes on the face. 6. 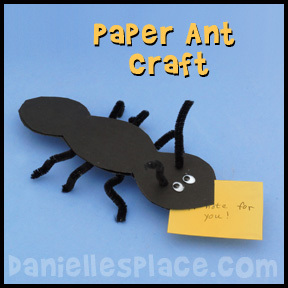 Have your children write the Bible verse on sticky notes of cardstock and place it in the ant's mouth. 1. Cut the cupped end of one spoon off leaving a short neck. Glue the cupped part onto the end of another spoon so that the end of that spoon is in the middle of the cupped part as shown in the diagram. 2. To make the middle part of the ant thicker you can use the handle of the spoon you cut in half. Cut the handle to fit in the middle of the ant and glue it on. 5. 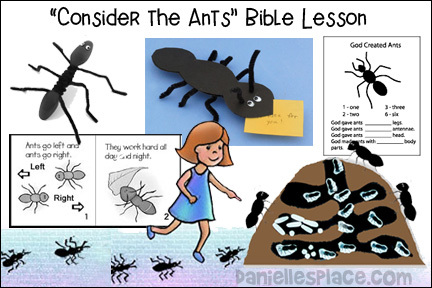 Have your children write the Bible verse on sticky notes of cardstock and place it in the ant's mouth. Print out the ant paper and make copies. In class have the children make a list of things that they will try to remember to do without having to be reminded. Review their list each day. When you see your child doing something without being told, you can compliment him and tell him what a good little ant he is being. Preschool children will have a hard time remembering to do things without being asked, but you can give them little reminders during the day without actually asking them to do something. For instance, at bed time you might say, "It's almost time to go to bed, I wonder what a wise little ant would do before he goes to bed?" When your child remembers to do something without being told place an ant sticker or a star on their ant paper next to the thing they remembered to do. Divide your children up into groups of three to form ants: the head, the thorax, and the abdomen. The children who are the thorax and abdomen should place their hands on the shoulders of the child in front of them. Let them practice walking together saying left and right, left and right, as they go. Tell them to try to keep their feet all moving at the same time. Next, have them try marching to the Ant Chant. Copyright - Even though this is a free lesson it is still copyrighted. It is for personal use only. It may not be reproduced or transmitted in any form or by any means, electronic or mechanical, except for local church, school, or home use. It is illegal to copy this material and publish it on another web site even if you include the copyright notice. You must have permission to copy the material. To request permission to copy this material for any other use contact me by email. You can use these cards to make up all kinds of review games. Before class write the letters a, n, and t on the back of the cards. To make the game harder and to review other letters you can write other letters on the cards. Place the cards face down in the middle of the teams. The object of the game is to be the first team to spell out the word "ant". Ask the first team a question, if they get it right they get to pick a card. The first team to get all three letters to spell out ant wins. Write one word of the verse on each ant card. Make a set for each child. Mix up the words and give a set to each child. See who can put their cards in order first. Beginning readers will enjoy this Itty Bitty book. 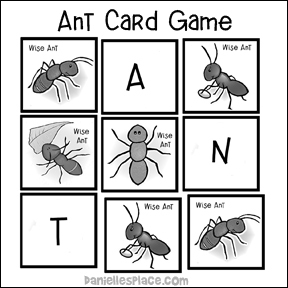 You can find even more activities on the free ABC, I Believe Ant Lesson for home schools. To be all they can be. I taught this lesson in my class last week. 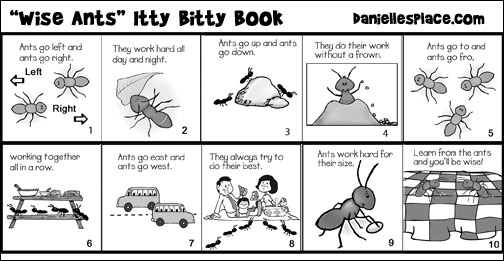 I started the lesson by reading a cute little book about ants to the class called "Those Amazing Ants" by Patricia Demuth. It has great pictures and interesting information. For instance, did you know that the ants fold up their six legs and their feelers and sleep snugly at night and when she wakes up they yawn and stretch just as we do? Your children will love this book. You can probably find it at the library. I found a craft where you take a paper plate and draw or glue pictures of food on it. Before class I glued round magnets to Popsicle sticks and cut out small ants. I punched two small holes in the middle of each ant. In class I let the children put brads through each hole and spread them to make the ants legs. We then glued the memory verse to the plate. They could move the ant on the plate with the magnet underneath. The kids loved it. I also made the ant game you suggested. I took business cards and printed out a picture of three ants from my Printmaster program. Then I cut and pasted pictures from Printmaster in 2's into my Word program. I cut them out and pasted them to the underside of each card. Each picture depicted a way to "do what you're supposed to do without being told." (We repeated this frequently through out the lesson in a singsong fashion.) We had 25 different things. We turned the cards over with the ants up and the children took turns drawing two and trying to make a match. Each time a picture was turned over we had the children tell us what it was. For example, wash the dishes without being told. The children loved it and didn't want to stop. It really made a big impact. Thanks for this series. I teach younger pre-school but they loved it. We colored the ant and the older ones traced the letters. They were proud to show off their letters. We also did the raisin and graham cracker snack. They were so funny. Many would not eat them because they thought they were really bugs. Sandi I just wanted to let you know I just did the Consider the Ant lesson and the kids had a blast! I had 9 kids ages 2-5. This was the second lesson I have used from the site and plan on using them every week. 1. I printed off 200 ants and enlarged them and had them laid out down the hall into our classroom and into 5 different ant trails. At the end of each trail I had words laying to say, "Do what you are suppose to without being told". The kids picked a trail to follow and brought back a word one at a time. 2. I enlarged the color sheet and the kids colored them. Then I put rubber cement on the anthill and let the kids sprinkle sand on them. They loved that! 3. I enlarged the anthill and ran copies of it on brown construction paper. I gave them a green sheet to glue the anthill to. I also gave them foam ants to glue onto the anthill. I then printed off the NIV Proverbs 6:6 Verse on white paper and the concept, "Do what you are suppose to without being told" and cut these into rectangles that the kids glued at the top of the green construction paper. These really turned out nice and had the concept of the lesson on them. They are a great reminder of what we learned. 4. I enlarged the ant pattern and printed them out on black construction paper. I cut them out and pre-punched the holes and the kids put the pipe cleaners through them for the legs and feelers, they also glued on wiggle eyes. These turned out really cute. I enlarged these 200% so they almost filled a regular 11" sheet of paper. They were so cute and stood up on the pipe cleaner legs. 5. I took large green paper plates and let the kids put food stickers on them. I took one foam ant per child and put a paper clip through its legs so the ant was on top and the paper clip on the bottom. I gave each kid a round magnet and they moved the ant around the plate. They loved that and it gave them a game to take home and play over and over again. I saw several kids playing with them in church and it felt nice to know the crafts were actually being used. 6. We ate the ants & sand for a snack. The kids loved that the snack went with the theme. Crushed graham crackers and raisins in zip Baggies for each kid along with a spoon. 7. We went over the ant paper on what we can do without being told and the kids had a lot of neat ideas. I sent this home with each kid along with a note asking parents to help enforce the lesson over the next week. 8. We did finger print ants and talked about the ants having three body parts then we did the can you find the missing ant sheet and they all found it! 9. They loved marching around while I sang the songs. 10. I printed off signs saying, "Do what you are suppose to without being told." and had these hanging all around the room. I had enlarged ants hanging on the walls also. I also made posters listing things like: Pick up your toys, clean the table, pick up your dirty clothes, brush your teeth, go to sleep, stay with your parents while shopping, say thank you and please, wash your hands before eating and after using the bathroom. 11. I printed off pictures showing kids doing chores and things and glued them to the back of several ants and we had a match game seeing who could find the matches. 12. To pick up the ants we played a game where each kid rolled a dice and got to walk to the end of a trail and pick up the number of ants they rolled to see who got the most ants. 13. I typed a letter to the parents with the verse we were studying, Proverbs 6:6 NIV, along with the concept and attached the list of things we can do without being told and asked the parents to reinforce the lesson during the week. We are limited in space at our church building, so instead of an ant trail hunt through the building we had a hidden trail in our room. Before the children came into the room in the morning, I made ant cards I had cut out with the words "We can do our work without being told to do it." (one per card). I also wrote a number on each card so the students who don't read well but do know their numbers could help put the words in order after they were found. Next, I taped the ant cards under the table where the students sit. After we talked about ants awhile I introduced the activity by saying "Did you know ants can walk sideways and upside down? There might even be some ants in this classroom right now walking around." This got them looking!!! They loved finding ants under the table! I just wanted to thank you for this series. 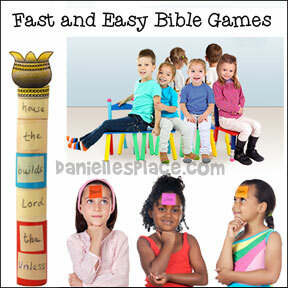 We just finished a 9 month study of these in my Wednesday evening Bible hour, 4 yr - 4th grade. We called ourselves "Critters for Christ". We even had T-shirts, etc. The kids did great! I just wanted to tell you what a great lesson the "Consider the Ants" Lesson was. My kids loved it! I have the 2 to 5 year olds on Wednesday night and we started the ABC series last Wednesday. I told them about the ants how God wanted them to be hard workers like the ants. The kids really enjoyed making the ants with finger prints. We used washable finger paint instead of an ink pad. They also thought the ant page with traceable letters were awesome! Thanks for all your hard work! When I used the anthill sheet I took the time to have children draw tunnels and the various chambers before doing the fingerprint ants. This gave us the opportunity to discuss the inside of the anthill. It just occurred to me that the idea of transparency in the X-ray fish project (X Lesson) would also be a great addition to the anthill. Next school year I plan to do this too. 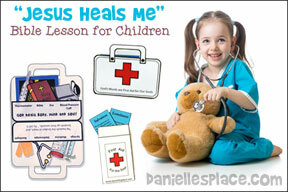 The lessons on this page can be found on The Resource Room a subscription site designed specifically for Sunday School teachers and children’s ministry. Join the Resource Room today! 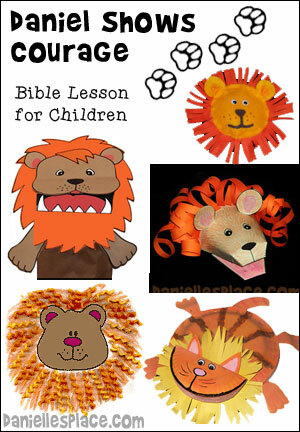 You will receive online access to complete, easy to prepare, bible lessons, new craft ideas and patterns. 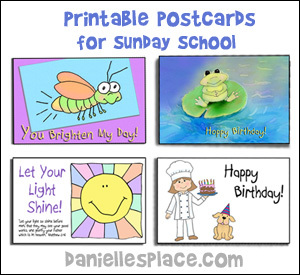 Sample Sunday School Lessons Page. 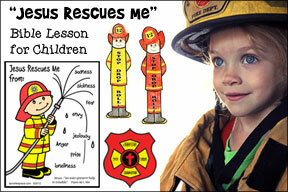 Free Sunday School Lessons for Children Page. Faith Based In the Beginning Kids Rug Rug Size: 5'4" x 7'8"